I was watching ESPN SportsCenter on Sunday catching up on the highlights and I noticed a commercial playing during one of the breaks. It is for a company called Case IH which sells farming heavy equipment (tractors, combines, etc.). The commercial is well produced — beautifully filmed wide shots, soulful voiceover, rich music soundtrack — clearly, little expense was spared. You can see my camera phone video capture of the commercial here (sorry, not sure why it did not capture the audio). The video is also currently playing on their USA website home page at www.caseih.com. Holy fertilizer! I have never seen a $25,000 discount advertised! I wonder if they will throw in a Sham Wow if I order within the next 60 minutes! 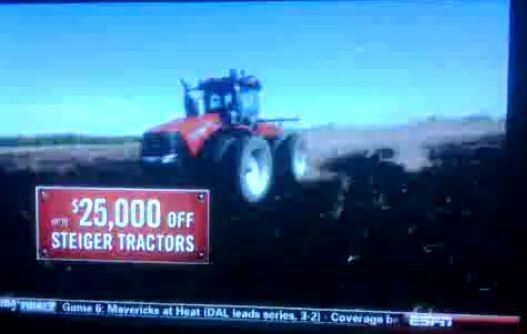 Duane Nelson, Case IH director of global branding and marketing, said “this campaign won’t leave a doubt in anyone’s mind that Case IH is the equipment maker that puts farmers first.” Ironically, seeing this ad on ESPN made me doubt that Case IH (or their ad agency, Cramer-Krasselt/Milwaukee) knows anything about their target audience. I suspect their prospects probably are not living in Boston. And they probably are tending the fields or at church on a Sunday in June at 10:00 am instead of watching the tube (granted, my knowledge of hard-working god-fearing farmers is completely based on stereotype). National TV seems like a terribly inefficient way to reach buyers of heavy farm equipment, and I have to believe they would be better off doubling-down their investment on vertical print, database building, targeted web, social media development, channel marketing funding, etc. Use these methods to drive traffic to the same commercials posted on YouTube. Maybe the ESPN commercial was “added value” negotiated into the plan for no additional charge along with a more targeted cable buy and media plan. But if so, I would have gone with one of their more branding-centric ads, not one promoting discounts (example of Case IH branding-centric ad here). Promoting discounts in a broad-based medium like TV just conveys the impression that you are selling a commodity product, and that cheapens your brand. Better to adopt a message that your product delivers superior *value* vs. the competition (something like: “feature-for-feature superior to Caterpillar, but priced lower to help today’s farmers weather the current economic turmoil”). This entry was posted in Audience Acquisition, Media Planning, Vertical Marketing. Bookmark the permalink.